Hello, lovelies~ Any of you is a big fan of eyeliners? It can surely be intimidating for those who are new to makeup since it involves lining the eyelid with a risk of untidy lines or even a poke in the eye. Well, that used to scare me a lot back when I first started with makeup. I would always try and use a liquid liner whenever I wanted to make my eyes more intense. Plus, it does get boring using the same soft brown pencil liner sometimes. However, I had difficulties applying liquid liner until I discovered the pen/marker type liquid liners. Today, I want to review a new eyeliner pen from Mizzu I got from BeCuteYou (thank you! ), which is a relatively new brand of eyeliner on the market. The eyeliner comes in a plastic packaging that has all of the instructions and claims printed on it. It has the shade name on the opening flap on top, mine is black. I'm not sure if there are other shades aside from black, though. The eyeliner resembles a regular marker that would find in any stationary store, so it will definitely fit into most makeup bags. 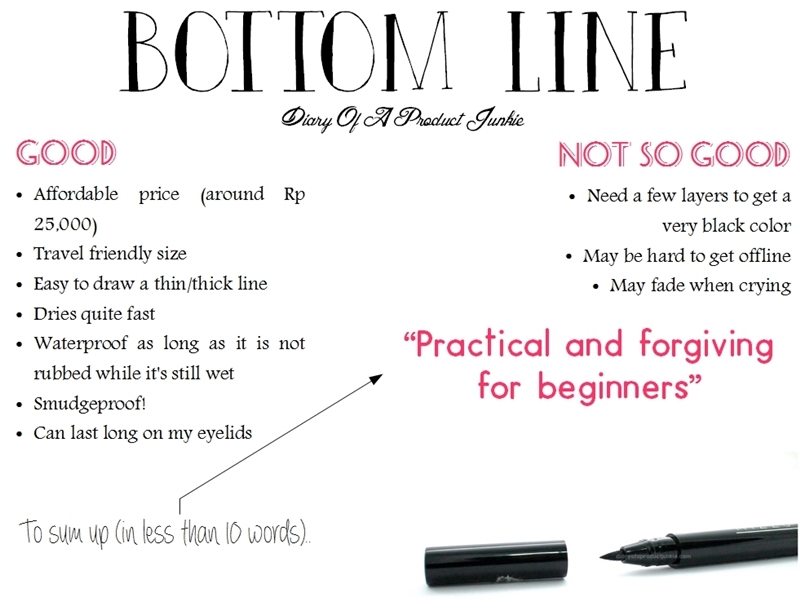 The tip of the eyeliner pen is quite thin, making it easy to draw thin lines on the eyelids. If I want to draw a thicker line, all I do was lay the other end flat on my eyelid. It was really easy to manipulate between thin and thick lines with this eyeliner due to the tip. 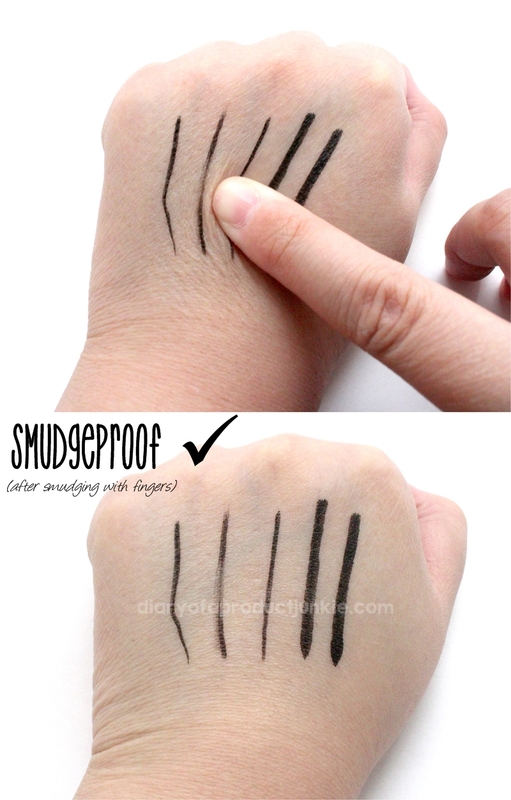 When swatched on the back of my hand, it is not an intense black liner. It needs a few layers to give a 'blackest of black' liner result. I've put this eyeliner through a series of tests to see its durability against smudges, water and tears. I know it doesn't say it's tearproof, but I just tested it for fun. As I've mentioned in the earlier paragraphs, lining my eyes with this type of eyeliner is really simple to do. Imagine using a regular marker to draw thin/thick lines on the eyelids and, voila! All done. It is a very forgiving eyeliner that even a beginner in makeup can use this with ease. Unlike my other eyeliner markers, Mizzu eyeliner lasts a lot longer. In the picture below, I only tested it for 3 hours because that is usually how long eyeliners tend to stay on my eyelids (thanks to the excess fat on the lids, lol). Plus, I only went out out to get lunch that hot and sweaty day, but I have tried to use for 6 hours and it is still there on my lids. Quite remarkable for a cheap eyeliner. Overall, it worked wonderfully on my rather oily eyelids, lasting for more than 3 hours. Although it doesn't have that 'jet black' color, I still prefer this to using a conventional liquid liner because of the practicality for everyday use. You can see the likes and dislikes I have for this product below. If you want to give this eyeliner a try, you can browse at BeCuteYou where she have most of the Mizzu eyeliner (and mascara) in stock. You can try and see her facebook page, twitter or message her directly to ask for the stock.